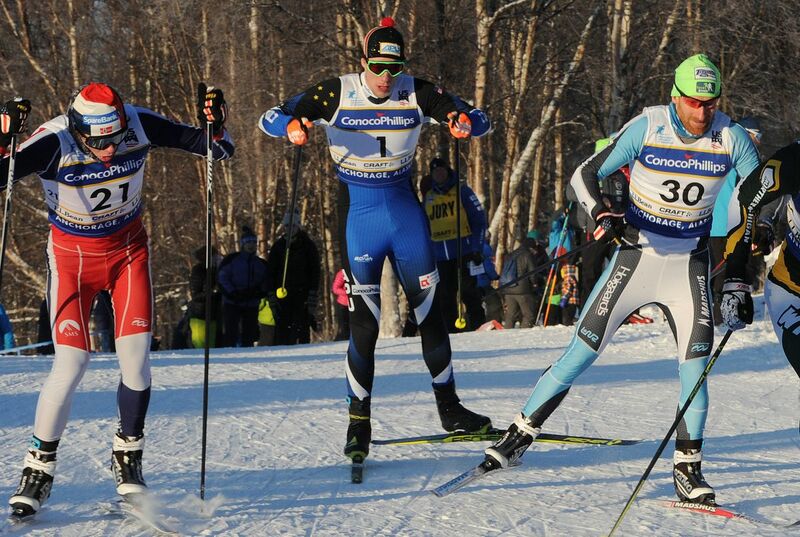 One of the Hanneman brothers of Fairbanks won a national ski championship Friday at Kincaid Park. The other didn't come close to making the podium. Guess which one gained the inside track for making the Olympic team? That would be Logan Hanneman, the one who didn't win. Reese Hanneman, 28, captured the freestyle sprint title at the U.S. Cross Country Championships with a thrilling win decided by less than a tenth of a second in the afternoon finals. He earned a $1,200 paycheck, a victory wreath, a kiss from his wife and boisterous cheers from a huge crowd. Hours earlier, Logan, 24, skied the fastest time in the morning qualifying round, a time trial that decides which 30 skiers advance to the afternoon round of head-to-head heats, from which a champion emerges. No wreaths or prize money for Logan, and not nearly as many accolades. But in the big picture, the day belonged to him. The national championships, which continue Sunday with mass-start classic distance races beginning at 10 a.m. at Kincaid, are doubling as the Olympic Trials. Results here will help decide who represents the United States next month at the Winter Olympics in South Korea, although much of the team has already been decided. That means only a handful of skiers racing in Anchorage this week have a chance to be selected to the team. Those choices will be based on points scored in select SuperTour races plus the national championships. When it comes to sprint races, points are awarded based on the results of qualifying round. What happens during the heats doesn't matter, at least from a point-scoring standpoint. And so it is that Logan Hanneman is the No. 1 sprinter on the men's points list. By clocking the fastest time in Friday's qualifications, he vaulted from a tie for second place to a 15-point lead heading into Monday's classic sprint, the final race of the selection process. "I'm already nervous," Logan said Saturday. "I was telling people I thought I would feel some mental relief from winning yesterday, but actually I'm feeling more stress." With 45 points available to the winner (second place is worth 35; third is worth 26), the standings easily could shift depending on how Monday's qualification round goes. And while there is no guarantee the final points-leader will earn an Olympic berth, the common belief among skiers is the U.S. Ski Team will select one sprinter from the national championships. "They have indicated that they have the intention of taking at least one person," Hanneman said. "In my mind, I would bet it's only one person, if that." Among those in the running for the spot are both Hannemans — Reese picked up 26 points for being Friday's third-fastest qualifier — Cole Morgan of Idaho and Nicholas Michaud of Montana. That the battle for an Olympic spot pits brother against brother "is just a little bit of poor luck," Logan said. "We wouldn't be here without the other, so it's been all good," he said. The Hannemans, who went to high school and college in Fairbanks but live in Anchorage now, have laid claim to the last three national championships in the freestyle sprint. Reese won the race in 2016 and again this year, and Logan won it last year. Both skiers said their focus Friday was on the morning qualifications, not the afternoon heats. "I wanted to have a good qualifier, because that's what counts for Olympic qualification," Reese said. "The heats were just a bonus." Said Logan: "With so much focus on these qualifiers, honestly I don't think about the heats at all. I do all my preparation thinking solely on the qualifier. When I get to the heats, I'm kind of mentally checked out." The U.S. Ski Team is placing importance on sprint qualifying results because it doesn't matter how well a skier performs in the head-to-head, six-man heats if he can't ski his way into the top 30 in the qualifying round. Logan, a part-time engineer for Airframes Alaska of Chugiak, said he's resisting the urge to crunch a lot of numbers prior to Monday's race to figure out what he needs to do to keep his lead. There are too many ways the race can unfold, too many numbers, to do that. "There's a few scenarios that could play out that could shrink that gap to nothing or (make me) No. 2. It's not over yet, for sure," he said. "You can do all the math in the world that you want but at the end of the day I have to go out there and I have to win it. Technically I don't have to, but yeah, I'm just going to prepare like I did (Friday), that I have to win it." Forty years ago this week, the U.S. championships came to Anchorage for races at Russian Jack Springs Park and Kincaid Park. Temperatures plummeted below zero that week, and many of the races were held in temperatures so low current rules would have force postponement or cancellation. John Estle of Fairbanks, a long-time coach and race official, was among those who raced at the 1978 championships. He said about 20 alums from that race series are in town this week — some of whom live here, like former Service High coach Tom Corbin and extreme adventurer Tim Kelley, and some who are here just for the championships, like Northern Michigan University coach Sten Fjeldheim. The Daily News hopes to take a group photo Sunday morning of anyone who skied or worked at the 1978 national championships at Kincaid and Russian Jack parks. If you were there, we hope to see you near the timing building shortly after the start of the first race at 10 a.m.
During the podium ceremonies at Kincaid Park, wreaths made from evergreens are being placed around the necks of race winners. The husband-wife team of Rob Whitney and Holly Brooks are in charge of the awards ceremonies, and part of their endeavors include making the wreaths. "Our garage is full of them and we're having another awards-making party tonight!"